We want to help leaders like you provide a discipleship pathway for every man in your church. 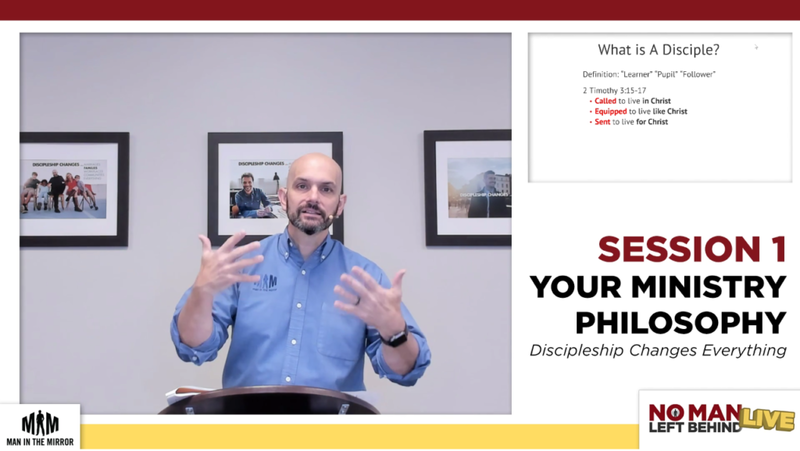 Our proven, practical leadership training has helped thousands of leaders from hundreds of churches be intentional about long-term discipleship. No Man Left Behind LIVE is the newest leadership training course offered by Man in the Mirror. Through a full day of teaching, discussion, planning, and consultation, your leadership team will build an ongoing game plan to reach ALL your men with a powerful vision and sustainable strategy. This 8-hour training experience is taught by our qualified faculty via simulcast and hosted at a local church by an experienced Man in the Mirror Area Director. 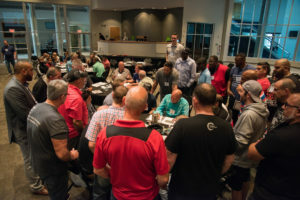 At each simulcast site, teams of pastors and men’s leaders from churches across the region come together to learn how to effectively disciple men, using the No Man Left Behind Model. Jumpstart your ministry and get a win with your men. No Man Left Behind LIVE is designed for teams of men’s leaders, pastors, laymen, and potential NEW leaders. We strongly recommend that leaders attend in teams of two or more to take advantage of discussion and planning times during the event. Tuition ranges from $39-$59 per leader, depending on the date of registration and how many members of the team register together – group rate discounts are available. Materials and lunch on Saturday are included. Churches often cover tuition as an investment in their ministry, but there are many ways we’ve seen teams attend: leaders pay for themselves; a donor in the church provides a scholarship; a team raises the funds through a car wash or other fundraiser; or it comes from the men’s budget as the annual leadership planning retreat. What can I expect after the training? Although the training will be beneficial to individual attendees, churches are most effective when a team attends together and returns to their church to implement the plans and principles. Churches that have been intentional about implementing the Model report significant gains: after an average of 2 1/2 years, they saw 48% more men in church and 84% more men actively engaged in discipleship. As you put your plans into place, we’ll be here to support you along the way! I want training! What’s my next step? Find a live training near you by visiting our schedule of events. Don’t see one in your area? You may also go through the video-based training, either online or with our DVD package. Have questions? Call Man in the Mirror at 407.472.2100 or 800.929.2536.